This T and O map, from the first printed version of Isidore's Etymologiae, identifies the three known continents as populated by descendants of Sem (Shem), Iafeth (Japheth) and Cham (Ham). 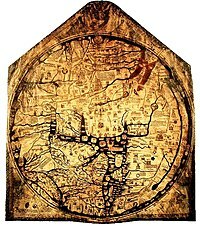 The Hereford Mappa Mundi, about 1300, Hereford Cathedral, England. A classic "T-O" map with Jerusalem at center, east toward the top, Europe at bottom left and Africa on the right. A T and O map or O-T or T-O map (orbis terrarum, orb or circle of the lands; with the letter T inside an O), is a type of medieval world map, sometimes also called a Beatine map or a Beatus map because one of the earliest known representations of this sort is attributed to Beatus of Liébana, an 8th-century Spanish monk. The map appeared in the prologue to his twelve books of commentaries on the Apocalypse. Latin: Orbis a rotunditate circuli dictus, quia sicut rota est [...] Undique enim Oceanus circumfluens eius in circulo ambit fines. 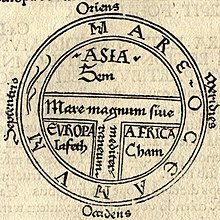 Divisus est autem trifarie: e quibus una pars Asia, altera Europa, tertia Africa nuncupatur. Although Isidore taught in the Etymologiae that the Earth was "round", his meaning was ambiguous and some writers think he referred to a disc-shaped Earth. However, other writings by Isidore make it clear that he considered the Earth to be globular. Indeed, the theory of a spherical Earth had always been the prevailing assumption among the learned since at least Aristotle, who had divided the spherical earth into zones of climate, with a frigid clime at the poles, a deadly torrid clime near the equator, and a mild and habitable temperate clime between the two. The T and O map represents only the one half of the spherical Earth. It was presumably considered a convenient projection of known-inhabited parts, the northern temperate half of the globe. It was then believed that no one could cross the torrid equatorial clime and reach the unknown lands on the other half of the globe. These imagined lands were called antipodes. The T is the Mediterranean, the Nile, and the Don (formerly called the Tanais) dividing the three continents, Asia, Europe and Africa, and the O is the encircling ocean. Jerusalem was generally represented in the center of the map. Asia was typically the size of the other two continents combined. Because the Sun rose in the east, Paradise (the Garden of Eden) was generally depicted as being in Asia, and Asia was situated at the top portion of the map. This qualitative and conceptual type of medieval cartography could yield extremely detailed maps in addition to simple representations. The earliest maps had only a few cities and the most important bodies of water noted. The four sacred rivers of the Holy Land were always present. More useful tools for the traveler were the itinerarium, which listed in order the names of towns between two points, and the periplus that did the same for harbors and landmarks along a seacoast. Later maps of this same conceptual format featured many rivers and cities of Eastern as well as Western Europe, and other features encountered during the Crusades. Decorative illustrations were also added in addition to the new geographic features. The most important cities would be represented by distinct fortifications and towers in addition to their names, and the empty spaces would be filled with mythical creatures. The world map from the Saint-Sever Beatus, dating to ca. AD 1050. From a 12th c. copy of Etymologiae. Mappa Mundi in La Fleur des Histoires. 1459-1463. Bünting Clover Leaf Map. A 1581 woodcut, Magdeburg. Jerusalem is in the center, surrounded by Europe, Asia and Africa. Unknown, Mer Des Hystoires World Map, 1491. This map follows the model of the T-O map, centered on Jerusalem with East (the biblical location of Paradise) at the top. On the left part of the sheet is a zonal or climatic map, communicating geographical information. On the right is a "T-O" map.By Jacobus Philippus Bergomensis. ^ Stevens, Wesley M. (1980). "The Figure of the Earth in Isidore's 'De natura rerum'". Isis. 71 (2): 268–277. doi:10.1086/352464. JSTOR 230175. ^ a b Michael Livingston, Modern Medieval Map Myths: The Flat World, Ancient Sea-Kings, and Dragons Archived 2006-02-09 at the Wayback Machine, 2002. ^ Hiatt, Alfred (2002). "Blank Spaces on the Earth". The Yale Journal of Criticism. 15 (2): 223–250. doi:10.1353/yale.2002.0019. Crosby, Alfred W. (1996). The Measure of Reality: Quantification in Western Europe, 1250-1600. Cambridge: Cambridge University Press. ISBN 0-521-55427-6. Lester, Toby (2009). The fourth part of the world: the race to the ends of the Earth, and the epic story of the map that gave America its name. New York, NY: Free Press. ISBN 9781416535317. Mode, PJ. "The History and Academic Literature of Persuasive Cartography". Persuasive Cartography, The PJ Mode Collection. Cornell University Library. Retrieved 22 October 2015.